Kutna Hora: Historical Town Centre with the Church of Saint Barbara and the Cathedral of our Lady at Sedlec symbolize the wealth this city derived from silver mining. The earliest traces of silver have been found dating back to the 10th century. The silver boom started in the 13th century. The town of Kutná Hora has several interesting late medieval buildings, built in Gothic style. They include the Italian Court (location of the Mint) and the Little Castle. The late Gothic Saint Barbara Church dates from the 1380s. Saint Barbara is the patron saint of miners. The Cathedral of Our Lady at Sedlec was rebuilt by Jan Blazej Santini in the Gothicizing Baroque style (early 18th century). 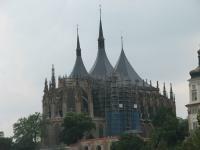 It lies 1.5km outside of Kutna Hora, and was part of a Cistercian monastery. Kutna Hora presented itself to me as a charming and quiet town. I stayed there for 4 days (in Hotel Garni Na Havlicku, recommended). Quite a lot of restaurants there have garden terraces, and the food is good and cheap. Actually, everything is. My sightseeing in and around town brought me to the Italian Court (see pictures in the picture gallery). During Kutna Hora's silver rush this functioned as the Royal Mint. The interior is palace-like. 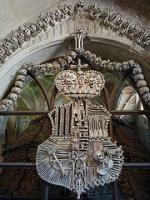 Also worth mentioning is the Ossuary in Sedlec. This freak sight dates from 1870 - when Frantisek Rint decided to become creative with the bones of the 40.000 people buried here. And I didn't even get to see what is reported to be the highlight of Kutna Hora: an underground tour through the silver mine shafts. At this time of year (and in weekends) you really have to pre-book this guided tour. Unfortunately I wasn't aware of that. But Kutna Hora was really worth visiting anyway. Kutna Hora is possibly the third most popular World Heritage Site of Czechia after Prague and Cesky Krumlov, after great peaceful time in Moravia, Kutna Hora welcomed me with the horde of tourists, but unlike Prague and Cesky Krumlov, most of visitor here seem to be European students. I started my visit at Sedlec to see the Cathedral of our Lady, to my surprised the carpark was packed with school tour buses with hundreds of students in front of the cathedral and I saw incredible long queue in front of the famous Ossuary, a scene that immediately made me to turn my car back to somewhere else. I walked aimlessly around Kutna Hora’s historic center, I could not find anything remarkable from the historic center, except Church of Saint Barbara area which in my opinion the real highlight of this city. The walking promenade from the city center to Church of Saint Barbara along the former Jesuit collage was truly beautiful with great view of below valley and the decorative statues along the pathway, almost similar to Prague historic Charles Bridge. 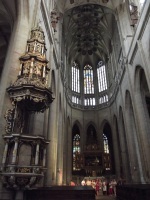 The Gothic Church of Saint Barbara was quite stunning for its location and its unique roof design; however, the interior was not match its exterior attractiveness. Then I walked back to the city center, as I ready mentioned, nothing really stunning, but the city was nice, the wealth from silver mine helped the city development pretty well. Since Kutna Hora was full with group tours, most of them were actually half day trippers from Prague, so there were times that there were no people at all, except at the Sedlec ossuary. Anyway apart from unique design of Saint Barbara and its lovely surrounding area, I would say Kutna Hora was similar to other lovely Czech cities with nice historic centers and great churches which made me wonder if Kutna Hora has been nominated to be World Heritage Site today, with current standard of ICOMOS, I am not sure it will make a clear cut to be on the list. This is a film I made about the town Kutna Hora in the Czech Republic (Swedish voice-over with English subtitles). This site includes two important churches, the Church of Our Lady at Sedlec and the Cathedral of St Barbara in the Old Town. In addition the Old Town also includes a number of other structures including the Italian Court, Little Castle and the Stone Fountain, all of which display interesting carved masonry. While Sedlec is close to the Kutna Hora main railway station, a shuttle train operates regularly from here to Kutna Hora Mesto station, close to the Old Town. I visited this WHS in May 2012. The Church of St Barbara and the town centre with the huge Jesuit building are quite interesting to see. 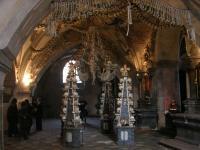 In Sedlec, next to the Cathedral, there is a very interesting ossuary or bone church which shouldn't be missed! 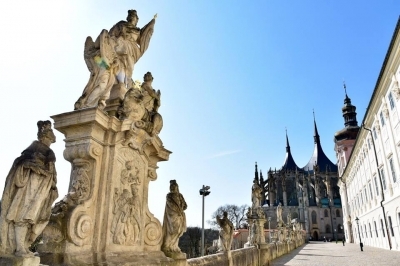 I have been twice in the town of Kutná Hora, situated in the valley of the river Vrchlice, that forms also with a precipice the historic centre, divided in Upper and Lower Town. Because of the exploitation of his silver mines it was prosperous from the 13th to the 15th century and became the mint of the kings, that often frequented it and transformed it in one of the most important economic centres of the state. It recovered from the destructions of the hussites wars and from a fire, but the geographical discoveries, after that a lot of silver came from the american mines at lower cost, caused its decline. The most important building is the stunning church of St. Barbara, constructed with the financing of the miners by Peter Parler, Matěj Rejsek and Benedikt Ried. It began as a group of eight radial chapels with trapezoidal interiors arranged in horshoe form separated by trihedral piers with a central axial pillar. Then, after the Hussite Wars, were also added five naves and outer chapels. Then were constructed the choir, supported with double-arched fliying buttresses, and the presbitery. Finally were reconstructed the vaults and the roof. In the 19th century were constructed the facade, the portal and painted the coats of arms on the vaults. Inside you can admire beautiful frescos, glass windows, altars, pulpits and choir stalls. By the church begins the St. Barbara Street with the Chapel of Corpus Christi and the long building of the Jesuitic college, projected by Giovanni Domenico Orsi, which goes to the castle, that has a tower with vaults, nice oriels of the two chapels and the Room of the Riders, with frescos. Near that it is erected so called Italian Court, a big Gothic (reconstructed in the 19th century) mint and residence of the minters, that for some period was also used like a royal palace, with a court, a tower, a privat royal chapel (with a nice choir, statues and altars), some rooms for hearing and receivings with nice ceilings. Adjacent to that is the church of St. James with a tower 82 m high, original furniture and a painting by Johann Peter Brandl, and remains of the fortifications. In a quiet square of the centre is the beautiful Gothic Stone Fountain, projected by Rejsek and the church of St. John of Nepomuk, projected by František Maxmilián Kaňka with nice frescos by Franz Xaver Palko and Josef Redelmayer and statues. Near that, near the nice Square of Palacký and the Street of George of Poděbrady, is also the column of the Virgin. Other churches were constructed in the historic centre: the church of the Ursuline convent,projected by Dientzenhofer, and St. Mary “na Námìtí”. Beautiful are the Gothic, Renaissance, Baroque and classical houses in the centre: the Stone House, a decorated Gothic building, the archdeaconry, the Riders' House, the Prince's House and the Sankturini's House. In the quarter of Sedlec is the cathedral of Our Lady, part of a cistercian monastery, constructed in Gothic style, after it was destructed by the Hussites, and reconstructed by P. I. Bayer and Jan Blažej Santini Aichel in his personal style of Gothicizing Baroque. 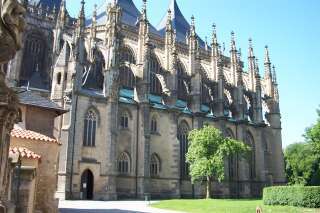 It has five naves, a pentahedral apse, nice vaults, frescos by Johann Jacob Steinfels and paintings by Brandl. I liked very much this town because of the beauty of its architecture even if the most important monuments were closed when I went there. It's absolutely worth to be visited and justifies the inscription, also because its historical importance, even if could be inscribed also the ossuary of Sedlec. Because of its rich silver mines, Kutna Hora was Bohemia´s second largest city in the Late Middle Ages and in the Renaissance period. Today it has lost much of its importance, but it´s still one of the Czech Republic´s star attractions. The old town of Kutna Hora is well preserved and offers a great view of the surrounding area, since it´s located on a hill. The church of St. Barbara, the Italian Court and the Czech Silver Museum are definitely worth a visit (although I didn´t get to go on a tour of the mines, either). 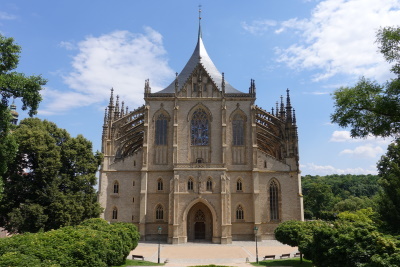 The suburb of Sedlec offers two more attractions - the Cathedral of Our Lady (newly renovated) and the weird Ossuary, which isn´t, as far as I can see, a part of the World Heritage site, but should be. Kutna Hora is an easy daytrip from Prague, but can also be reached from Brno. It´s definitely one of the best sights in the Czech Republic. 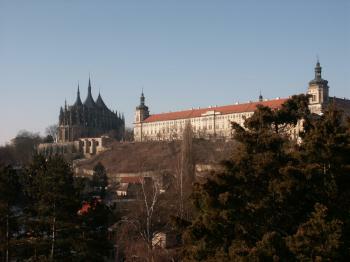 A very pleasant day trip from Prague, Kutna Hora offers much for the active visitor. 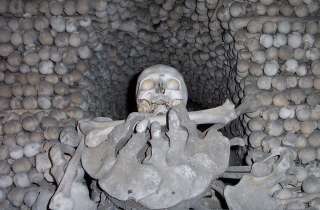 As mentioned below, the train station is actually in a different town, Sedlec, a few kilometres away, but fortunately, the walk is interrupted by a visit to the eerie Ossuary, in which the bones of some 40,000 people are artistically arranged (picture to the right). The rest of the walk takes you through the mostly modern outskirts of Kutna Hora, which tell you little of the pleasures that await in the centre. The old town is dominated by St. Barbara's Cathedral that sits on the hill, but the main square and other smaller churches are very enjoyable as well. Busses run relatively infrequently, particularly on weekends, which means that the best, if somewhat tiring, mode of transport around is footpower. Kutna Hora makes a great half/ full day trip from Prague. I have great memories of this place and it is well worth the short trip out here. The centre is quite nice with a few interesting churches and some nice back alleys to lose yourself in, however the highlight is Sv. Barbara’s Cathedral which is particularly impressive. The approach to it is lined with statues, similar to Prague’s Charles Bridge, with lovely views over the river valley below. The roof and flying buttresses make the cathedral spectacular and make it different from many other cathedrals on the list. The interior is nice but nothing really spectacular. The train station is quite a way from the town centre. You can catch a bus up but I would recommend walking as this would means you can call into a strange addition to the site which is the Ossuary in Sedlec. It is just off the main road to the centre. The interior of the church like building is decorated with bones in a particularly intricate way. There are a fair few nice restaurants and cafes in the centre to while away the time. There is enough to see here for a few very laid back days, however it is a very viable day trip from the capital. It is only an hour’s train journey, though you may have to change trains at Kolin to take the local train one stop south. We spent several hours in Kutna Hora (mainly in St. Barbara), en route for Opava, in August 2004. St. Barbara was stunning - especially the interior. I'm only sorry that I can't find any web pictures of the interior (and not many of the exterior either!). This cathedral, and the whole city are well worth an extended visit. We want to return, and explore it properly before long. Kutna Hora is a charming place. The Cathedral of St Barbara is as wonderful as the Sedlec Ossuary is macabre and unique. There are some beautiful buidlings, not least the interior of the Italian court. Elbe and its tributaries: The river Vrchlice is the boundary of the WHS, it is a tributary of the KlejnÃ¡rka, which is a tributary of the Elbe. 243 Community Members have visited.